Eurielle went on to twice win at The Horse of The Year Show (2000, 2004), and also represented England, winning the "International Working Hunter Pony" competition for three consecutive years. After graduating from a vocal scholarship with St. Peter’s School in York, Eurielle spent two years preparing to audition for the three major classical music conservatoires in London, and also became a member of the National Youth Choir of Great Britain. 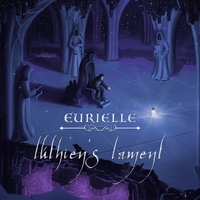 Eurielle accepted a vocal scholarship for the Bachelor of Music Course at The Royal Academy of Music in 2007. Under the esteemed, late Noelle Barker OBE at the Academy, Eurielle explored her musical range and started to develop the sound which would later become her trademark – a classically infused but modern musical take on the stories of mythology, legend, fantasy and our own human nature. Whilst still at college, in 2010, Eurielle was introduced to multi-platinum producer Ryan Laubscher of Inception Productions who has worked with Dido, Katherine Jenkins, Pixie Lott and Russell Watson. Ryan and Eurielle saw in each other the perfect musical match and they began to co-write and record together. The songs produced so far have consumed thousands of hours of recording and studio time and reflect the musical aspirations of both producer and artist. To date, Eurielle has released an EP - 'The Incarnation' (2013), two singles; ‘Gold’ (2013), and 'Carry Me' (2014), and in December 2015, her Debut Album – ‘Arcadia’, as well as a selection of official videos, all of which were shot by award winning cinematographer Nick Cooke (Inter Film Festival Berlin, Cannes Corporate and TV Awards, amongst others). Her work has already earned her the recognition and endorsement of BBC Introducing with her song 'Raindrops' being selected several times for airplay in both Essex and Suffolk, and online she has attracted a substantial fan base on YouTube with millions of views of her recordings. Her natural ability to connect with her voice, coupled with a pure simplicity of tone has subsequently resulted in strong demand for her vocals for high profile film, TV and video game soundtracks from pre-eminent composers including Emmy Award winning John Lunn, Harry Potter composer Nicholas Hooper, and two time Ivor Novello Award winning Benjamin Wallfisch, seeing Eurielle record for the likes of Downton Abbey, Disney, the BBC, the Rio Paralympics 2016, Kaleidoscope Pictures, and 20th Century Fox throughout the course of this year alone. 2017 looks set to be another busy and exciting year for Eurielle with several more major soundtrack projects in the pipeline and numerous high profile collaborations planned, as well as the writing and production of more original music to follow Arcadia!